I. THEME: Ask! And it shall be given to you. Human beings have many needs, spiritual and material. One of the things we do when we pray is to ask God’s favors for ourselves, our family, society and Church. What God wants us to do is to firmly believe that He shall grant our prayer; especially when we are in a desperate situation when we can’t rely on anybody except God. 1/ Reading I: Queen Esther implored God to save the Israelites from the tragedy of annihilation. 1.1/ Queen Esther’s mortal anguish: She was a Jew on exile and selected to become the Persian queen, in place of queen Vatti, who was discarded because she came to king Ahasuerus without his knowing. Mordecai, Esther’s uncle, was also a high rank officer in the royal court, gave her an order to hide her identity. King Ahasuerus promoted Haman the Agagite, the son of Hammedatha, and advanced him and set his seat above all the princes who were with him. All the king's servants who were at the king's gate bowed down and did obeisance to Haman; for the king had so commanded concerning him. Mordecai did not bow down or do obeisance because he determined to bow down only before God. Haman was furious of Mordecai and plotted out a plan to annihilate all the Jews in the area. 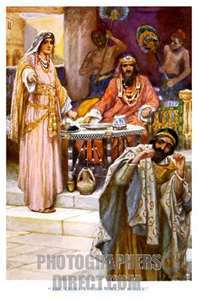 Mordecai let queen Esther know of Haman’s wicked plan. He wanted her to intercede with the king for her people. She didn’t know how to do it because if she came to meet the king without his invitation, she would be killed. But if she didn’t act, her uncle and all the Jews shall be annihilated, and she, as her uncle warned, shall not be safe with king Ahasuerus and Haman. 2/ Gospel: God shall give good things for those who ask Him. 2.1/ God’s promise to people: Jesus said to his disciples: “Ask, and it will be given you; seek, and you will find; knock, and it will be opened to you.For every one who asks receives, and he who seeks finds, and to him who knocks it will be opened.” Jesus gave a simple reason for this: God is the Father of all. Since He is the Father, He must concern of the needs of all His children. (1) The father on earth: To make an illustration, Jesus gave an example of an earthly father: “What man of you, if his son asks him for bread, will give him a stone?Or if he asks for a fish, will give him a serpent?” There is no father, who is moral healthy, does that. (2) The Father in heaven: Jesus concluded: “If you then, who are evil, know how to give good gifts to your children, how much more will your Father who is in heaven give good things to those who ask him?” God isn’t only the Good Father but also has power to do all things. To give His children what they ask for is obvious. Is this meant God shall grant whatever people ask for? No! People must ask good things, not anything. God always knows what is good for His children because He knows past, present and future at the same time. People don’t always know what is good for themselves because they are easy to forget the past; not always know the present; and have no knowledge of future. That is why we should always add the clause “if that pleases you” after our petitions. The reason why we are hesitated to give out is because we are afraid that if we are so generous, we shall run out of our financial resource. If we firmly believe in God’s promise, we are never run out our resource. God is the Creator of all things, He shall never be out of His blessings. Our hands are so tiny to receive His blessings. - Our Father in heaven isn’t a normal people; He is God, the Creator and the Controller of all things in the universe. - We should pray to God all day, especially in time of lonely and despair, as in the cases of Queen Esther and of Christ in the Ghetsemane Garden.